Our blog posts typically start with a quick intro story – a super-short narrative about something Angel and I have experienced, heard or read – that inspired us to write. And not surprisingly, based on our line of work, these stories often find their way to us through everyday interactions with our coaching/course students (of course, we always get permission before we share something publicly). Today, on my 47th birthday, I re-read the suicide letter I wrote on my 27th birthday about two minutes before my girlfriend showed up at my apartment and told me, ‘I’m pregnant.’ She was honestly the only reason I didn’t follow through with it. Suddenly I felt I had something to live for. Today she’s my wife, and we’ve been happily married for 19 years. And my daughter, who is now a 21-year-old college student, has two younger brothers. I re-read my suicide letter every year on my birthday as a reminder to be thankful – I am thankful I got a second chance at life. After injuring my back, losing my job because of it, being evicted from our apartment, moving in with Laura’s parents, nursing my five-year-old through a nearly fatal bout of strep throat, I was stuck in a tragic rut for far too long. And I was sitting on the front porch of my in-law’s house feeling sorry for myself, yet again, when my old college buddy called me crying and said, ‘Mel-Mel-Melissa, my baby girl, just died in a car wreck.’ And suddenly I felt like the lucky one. This morning, nearly five years after my husband’s passing, a beautiful couple and their three kids knocked on my front door. The man smiled and said, “Your husband was my heart donor. He saved my life. Not a single day has gone by that I don’t pray for him and think of you. Thank you! Yesterday my sister and I were in a pretty bad car accident. Luckily both of us were wearing our seat belts and didn’t have any major injuries. My sister is and always has been Mrs. Popular – she knows everyone. I’m the complete opposite – an introvert who hangs out with the same two girls all the time. My sister immediately posted a comment on Facebook and Instagram about our accident. And while all her friends were commenting, my two friends showed up independently at the scene of the accident before the ambulance arrived. My dad is a blind cancer survivor. He lost both his eyes when he was in his early 30’s to a rare form of cancer. Despite this, he raised my sister and I, and took care of my mom who was in and out of rehab for alcoholism and depression. My mom is a fully recovered alcoholic now, my sister and I have graduated college, and my parents are still together and back to being happy. I’m certain none of this would have been possible if my dad hadn’t been such a resilient, positive force in our lives. My dad’s mental strength literally saved our family. The drummer in our band, Nick, is legally deaf, and has been since he was born. But he can still hear low bass tones and feel the vibrations from the drums and other instruments. Honestly, he’s such an incredible drummer that most people don’t believe he’s deaf. Sometimes I can’t believe it myself. I’m sitting in my hospital bed waiting to have both my breasts removed. But in a strange way I feel like the lucky one. Up until now I have had no health problems. I’m a 69-year-old woman in the last room at the end of the hall before the pediatric division of the hospital begins. Over the past few hours I have watched dozens of cancer patients being wheeled by in wheelchairs and rolling beds. None of these patients could be a day older than 17. Tonight Angel and I met a family of six staying at a hotel in Miami where we were vacationing. We saw them hanging out in the lobby, sharing stories and laughing hysterically. So on our way out, we said hello to them and asked where they were from. “Oh, we’re from here,” the mother said. “Our house burned down to the ground yesterday, but miraculously, all of us made it out safely. And that makes today a day worth smiling about. Yesterday afternoon my twin sister called me from her hospital room. She’s been in a coma for almost a year now. Entering the holiday season and New Year with my sister back at my side is a priceless feeling. We actually spent the entire night together, talking and laughing. She’s still weak, of course, but surprisingly coherent. But you know what the really crazy thing is? A month before my sister’s accident, we got in a ridiculous argument and didn’t speak to each other for that entire month. And today, honestly, neither one of us can even remember why we were so darn mad. Two of my ex-coworkers actually laughed at me last year when I told them I dreamed of opening my own hair salon. When I spoke with you and Angel on a coaching call that same afternoon, Angel said something like, “We’ve known quite a few people who went after their dreams and succeeded. One thing they all had in common was they got laughed at in the process.” Well, I’m happy to say, I opened my salon six months ago and business is great! My mom is a healthy 55-year-old who successfully owns and operates a popular bakery downtown – a goal she’s had all her life. 15 years ago she was diagnosed with stage 3 breast cancer. In the face of possible death, she quit her store clerk job, opened the bakery, started chemo and radiation therapy, and succeeded on all fronts. A coworker of mine died in a car accident on the way home from work last week. During his funeral several people from the office were in tears, saying kind things like, “I loved him. We all loved him so much. He was such a wonderful person.” Of course, I started crying too. But I couldn’t help but wonder if these people had told him that they loved him while he was alive, or whether it was only with death that this powerful word, “love,” had been used without question or hesitation. The happiest moment of my life is still that split-second a year ago when, as I laid crushed under a 2000 pound car, I realized my husband and 9-year-old boy were out of the vehicle and absolutely OK.
“It’s been exactly ten years since my controlling, abusive ex-fiancé sold my favorite guitar which cost almost $1,000 and took me ages to save for. He sold it on the day I broke up with him. When I went to pick up my belongings, he was proud that he had sold it to a local pawnshop. Luckily, I managed to track down the guy that bought it from the pawnshop. The guy was really sweet and gave it back to me for free, on the condition that I join him on his front porch for an hour and play guitar with him. He grabbed a second guitar and we ended up sitting there on his porch for the rest of the afternoon playing music, talking, and laughing. He’s been my husband for almost nine years now, and we are happier now than ever. Last night I was all dressed up and waiting on my blind date to arrive. He never showed up. It made me feel ugly and unworthy and abandoned. I thought he may have seen me from a distance and bailed. All sorts of negative thoughts were running through my mind. Then, as I left the restaurant alone, I heard a little girl ask her mom if I was a princess. It made me smile and changed my mindset. I decided to walk the long way home, and I truly took it in – the fresh air, the peaceful solitude, the moonlight glistening off the sidewalk. And I realized being alone right now was exactly what I needed. Yesterday afternoon I was sitting on a park bench eating a sandwich for lunch when an elderly couple pulled their car up under a nearby oak tree. They rolled down the windows and turned up some funky jazz music on the car stereo. Then the man got out of the car, walked around to the passenger side, opened the door for the woman, took her hand and helped her out of her seat, guided her about ten feet away from the car, and they slow danced to a song under the oak tree. My body sometimes feels sore, but it works. I don’t sleep well most nights, but I do wake up to experience another day. My wallet is not full, but my stomach is. I don’t have all the things I’ve ever wanted, but I do have everything I need. I’m thankful, because although my life is by no means perfect, it is MY life and I choose to be thankful in it, as I continue to do the best I can. I’m dying of Leukemia at age 18. I was sent home from the hospital for my final few weeks 156 days ago. But now I’m back at the hospital being treated again, because my doctors now believe there is hope. If you’re feeling up to it, I would love to hear from you. In a few short sentences, please leave a comment below and tell me something true about YOU. Photo by: The girl. Amelia. 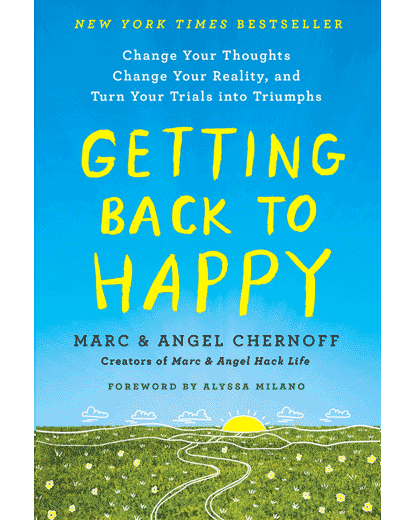 Marc, I’m so thankful I discovered your blog and book last year — you and Angel have truly changed the way I think. At my father’s funeral in 2001, an older gentleman walked up and introduced himself to me. He told me the story of how one weekend his furniture warehouse caught fire and all of his inventory was lost including much of the showroom. and how later that evening my dad, his competitor and someone he had only briefly met before, called him and asked him what furniture he needed and if he needed warehouse space to continue operating until insurance and his suppliers could get him operational again. I always wanted to be like him, but never more so then at that moment. Beautiful story. You are blessed to have had him as your dad 🙂 !! I helped my dad put the finishing touches on his new mountain house/cabin that he built with his own two hands after carving out a hillside in the mountains to do it. It took him nearly five years to complete. He’s 74-years-old. He’s been talking about this dream since I was a child (I’m 50 now). Seeing this dream realized is a beautiful thing. When I was diagnosed with schizophrenia 20 years ago, two different doctors said I would never lead a normal life. Since then though, I have been a successful musician and businesswoman for 15+ years, with my husband for 18+ years, own a home, a car and 2 cats, and this past week I rode on my first zip-line and did a walk for charity. 20 years and going strong… my life is wonderful! A wonderful life is not normal. I read about all the people who have troubles in their relationships. You can thank God you do not have a normal life. Definitely it’s about being true, true to you, to who you are and what you believe it’s worth to live for. This blog has helped me regain my positive outlook on life. I was so jaded, so bitter, but its stories like these that not only put my life in perspective, but make me realize that better is always possible. I feel happy to be happy again! My beautiful grandparents didn’t have a lot of money, but they were fiercely independent and generous with as much as they could manage. They were kind and thoughtful, and always gracious. My nan had a witty sense of humour and never spoke a bad word about anyone. It’s only as an adult that I have truly come to appreciate these beautiful qualities, and hope to instill these in the next generation. Grandparents are such an important part of children’s lives. Let’s not forget that. I sat across the table from her. Our dinners cold in front of us. Her story still going. Tears streaked her face. Sobs coming from my throat. Her story was right out of a movie. The horror of how her mother treated her just recently. Unraveling before my eyes. Made me look differently at the mother I have been cursing. The one who pushes me for answers to questions I don’t want to be asked. Only because she loves and misses me. She doesn’t have a dark and ugly side. She took care of us. Raised us. Complete with faults but full of love. I never knew how lucky I was until I saw how ugly it really could be. I am 41. At 18 months old I was scalded all over back and arms and neck by a boiling kettle . I nearly died. At 3 I suffered a severe hernia. Then at 18 I had a near fatal car accident and remained in an induced coma after breaking every bone in my head and losing my left eye. Then at 30 I was diagnosed with severe crohnes disease, and spent 16 weeks in hospital on a machine after a bowel operation went wrong and I got bad infection. Sadly after car accident I also got mixed up with the wrong crowd and took part in a lot of recreational drugs. respect to you man, very inspiring, that will help me keep my head up from now on. 7 year’s ago my little boy was diagnosed with autism, development delays..I was devastated. Our lives changed completely. It is still challenging, but easier with time. I love him so so much..when I am down or upset I look forward to reading your posts. My boy has autism too! And it was devastating at first… But now I can see this as the gift it really is – an opportunity to fully appreciate the little good things we usually don’t. Because we take nothing for granted, everything he does is a miracle. And that extends to the way we look at everybody. His autism has brought us so much joy and gratefulness! They say kids with special needs are God’s favorites… And he placed some of them in our families! Now THAT is a blessing! Love your blog, thank you for inspiring so many of us. When I was 9 my mothers father died. I vividly remember the deep depression my mom fell into. A year later she died of heart failure(heavy smoker and drinker) leaving my father to raise my two brothers and myself. Three weeks later my mothers only sibling(also a smoker and drinker) also died. These stories truly are incredible. Thank you for posting this! Some really inspiring stories here – really gets you thinking of the shortness of life! I guess I don’t have much of a “dramatic” experience to share, but I do remember the first time I actually felt alive, at age 19: I was sat on a plane, crammed in between two larger gentlemen, with a 16-hour flight ahead of me. I had nothing but my backpack with me, and a one-way ticket to the other side of the world. I had no idea what was waiting for me, or where I would go. And for the first time in my life, I felt truly free and alive. Thanks for sharing these stories! me: When will I get what I actually deserve? When will the hard work pay off? grandma: You know when you plant rice in field in June (lets say), and it’s harvested only in September … regardless of how much you want it sooner or scream about it, it’s never going to ripen by July. This saying of hers (which sounds so much better in my native language) helped me persevere!!! My fiance & I have known each other for 7 years, always knew there was connection between us. We have been happily together for the last 3. We both thought it would never work, he is 13 years older than me with 2 amazing boys. Initially it was difficult, but once we stopped caring what other people think & started living OUR life. We couldn’t be happier. I can’t wait to marry the man I fell in love with so long ago. I have been reading these blogs every day for a couple of years. The guidance provided in them, combined with 12 step work that I do in a program have transformed my life. My job is ending and I have seamlessly lined up a better job, just by keeping a forward thinking mindset. Keep up the good work. I got my period this morning. It’s hard to explain the crushing sadness that comes from another month of trying, and failing, to get pregnant. Not even my husband truly understands the deep sense of failure I feel, the futility, the anger at my body, at everything. It took us almost 2 years to get pregnant the first time. That monthly cycle of gut-wrenching disappointment nearly overcame me. But we had a beautiful son. He is the best thing I’ve done with my life. And even though I feel the thick sadness all around me today, we are so blessed. I cannot claim that life is unfair because my boy’s existence proves otherwise. I was at Walmart getting a key made. The clerk was an elder gentleman. We got in a deep discussion about values and the war WWII and Korean he had been in WWII toward the end and then the Korean war.. He had been a Marine and very proud of that. (Once a Marine always a Marine ) He shared with me a story that very recently, the remains of one of his comrades had been found thru DNA testing and being sent home to his daughter. He paused and swallowed…He said to me, “escorting home the bodies of those we served with, those bones are a part of us. We shared in something that can’t be described.” Boy did I have to swallow a few times to get thru that moment in one piece. As he handed me my key, I took his had and said, thank you for your service. I walked out of there truly humbled. My Dad always said he would live until he was 95, as his Mom had lived until she was 104. Even though my Dad smoked all his life we were very lucky to have him until he was 85. He was out working on his truck and doing odds and ends outside as all ways, but he had pain in his leg. The hospital didn’t find the blood clot that took his life later that evening while he took his much cherished bath. My brother and I know that he loved us, he was always laughing and cracking jokes and he never took life too seriously. At his funeral, we had the piano player, play some polka’s and my brother and I even danced. We celebrated his great life and the love he had for us. I think I heard my Dad laughing and shaking his head, as usual. Nine years ago to the day my fiancée died of cancer. Haven’t seen a happy second since and i still cry for her. There’s nothing to be happy about. If I’m unlucky I still have 30+ years of misery and sadness to look at before i can get some peace. I sat with her when her heard stopped. My last words was “breathe my love”. But she didn’t. I was a christian when i held her hand, but when I, after a few hours, finally managed to leave the room I was convinced that there is no God. Nothing I could do. Nothing anyone could do in fact. Nothing comforting about her death. Nothing to make me feel slightly better. Can’t even feel anything but despair now. Love? That’s apparently an illusion. That — are the harsh reality of life. But I truly hope some of You feel better than me. Im really sorry, I hope you will find some peace. I wish you that with all my heart. The day after my dad died his longtime friend called looking for him. I had to tell her he had passed. She was very upset. Then she told me that they had been friends for 10 years on the internet only and had never met. I’ve had so many tiny moments of perfect happiness. One comes to mind now. My beloved boy, my beautiful horse has passed away now, but a few years ago I was nursing him through an infection, working full time and driving 1.5 hours up to his paddock twice a day to check his water. One of those nights, I was exhausted and just wanted to go home and lie down. Toby repeatedly kicked the bucket over, so I had to go and refill it again. I was leaning against him and crying with frustration, and he turned his head and rubbed my forehead with his lips. We stood like that for a long time. Then, when I filled up the bucket again and schlepped it back over, he didn’t kick it over. Now, I don’t remember when he wouldn’t jump, when he kicked me or bit me or wouldn’t let me catch him. I remember every sigh, and when he chucked me in the water trough, and when he pushed me over in the sand, and when he tried to sit on me, and when he brought me a whole rose bush he’d pulled out of the ground. Thanks for letting me share. Thanks, I can relate. Today is not my best day so far however your story is uplifting for me. In 2007 I was in a traumatic car accident that left me a t-4 paraplegic. My injuries were severe and I had to relearn how to breathe, eat, and speak again along with adapting to my “new normal.” With the love and support from my family, friends and even strangers I didn’t let it break my spirits and love of living life to the fullest with a smile on my face. Now, I am making a difference first hand designing fashionable and functional clothing for those like me, in wheelchairs. My mission is to make people look good, feel good and be comfortable expressing their alter-ego through fashion while breaking down social barriers. When I was 9 years old, a friend of mine transferred school. This year, at age 14, having lost contact with her for more than 5 years, we found each other’s contact again through a mutual friend. Although we were not close then, we are now. Amazingly, every time I am down, she was there to help me get through. I thank fate for bringing us back together. Thanks for these stories. it goes to show that we all have problems and things to overcome. We never know how blessed we are until we hear about the struggles of others and how they overcame those. It also goes to show that no matter how bad things might seem to you it could always get worse. Thanks for sharing these stories from others. Thank you for these. As many made me smile which is what I needed as I sit here thinking about my grandfather who passed away this morning. I cannot say thank you in words to express how grateful I am to you.Your thirty little stories are so inpirational , it has given me a lot of hope to live and enjoy life to the fullest. IT has has given me a look back magnifying glass into my life. The reason to be happy today and to enjoy the air I breath in and all the beautiful things I see around. Hmmm about 1 and half years ago I had a terrible accident on the way to work. At that bleeding moment I asked God to give me some minutes to tell my kids and husband and friends something nice before I die but God has been given over 365 days, uncountable minutes to tell all the nice things I wanted to say. My husband and I have separated now but again I am filled with happiness right now because I have this beautiful day to enjoy plus I have another 24 hours to say good things to myself and to my children and to all my love ones. That’s what I hoped to live for when I had my accident. These stories and comments truly are inspirational!! My 33rd birthday was 2 days ago and although I’ve faced some pretty tough times, I’m absolutely sure that if we all put our problems into a basket, we’d want to take our own back. Everyone out there is experiencing some kind of struggle so be kind to everyone you meet. #19 spoke to me deeply and it brought tears. I’ve had a lot of sadness and tragedy in my life, but that just made me stronger. Every day I wake up and thank God for the beauty and love that surrounds me, my 3 perfect angel kitties that have brought me (and my husband) so much joy. I never thought in my wildest imagination that I would be here feeling so much gratitude. My life is way beyond my wildest imagination. I still have a horrible health problem but I feel so grateful every day and I have hope and pray that I’ll get well someday….maybe I won’t get well, but I have to believe that I will. Death is an unknown inevitability. My late uncle would often say: “We’re only here on a visit.” …and it’s true. Thank you Marc and Angel with all my heart. Your blog has helped me so much. I love short stories Marc! They can have such a powerful affect on you, and some of the messages behind them are really inspiring. I’m so glad you all appreciated these quick stories too. I just found your blog and this is the first post I’ve read. My little family is in the middle of a dark and difficult year and though I know we will get through and will come out stronger stories like this are so uplifting to read. So glad you shared. I’m definitely subscribing. These stories are profound and deeply moving. As a Trauma Surgeon, there isn’t a day that goes by that I don’t see people who suffer devastating injuries or lose their life or loved ones. My takeaway is this: the present moment is the only time we truly have. Live life to the fullest, because it’s the only one you’ve got! This past week, I saw the most difficult patient in my 21 years of practice. He was literally scowling and growling at me during the dental procedure. After the initial injections the patient turned toward me with a loud, angry grunt and shoved his middle finger in my face! It was quite a shock, but I was able to move beyond the action, and refused to pick it up as an offense. You see, I chose to focus on the wounded person, who needed help and healing regardless of my initial thoughts and feelings. War and PTSD have life long effects. So can grace and compassion. Thank you for sharing these beautiful stories – I loved reading each and every single one of them!! I was walking along the footpath with a friend, chatting. Against us, a couple were running to jump into a taxi pulled at traffic lights. In what appeared to me to be a seemless move (and they were still running), the man switched to the left side of the woman, pulled the curb side door of the taxi open for her, and continued to run around to the road side door and jumped in himself. It caught my breath as it was such a seemingly natural maneouver for them both. It reminded me of a wonderful man I once knew. I thought how I do really miss this kind of man. I was planning on retelling this event to a friend, when I thought – be that man, yourself. I’m a woman, but what I mean is I’ve lost my genuine kindness inside a struggle I’m currently navigating. I want it back. I think that’s what I actually miss. Thanks for the above life stories. I was born in a dysfunctional and poor family. When I was 5 yrs old, I witnessed my bad-tempered paternal uncle quarrelled and assaulted my mom and her head was bleeding profusely. It scared the life out of me. At the same year, while I was playing with some neighbourhood kids, my head was injured and there was blood tickling down. But my grandma merely washed me up and apply some ointment to my wound. I was denied of medical treatment. It was really painful and scary that day. After my mom recuperated from her head injuries, she became abusive. She would cane me and my sisters over some petty matters. There are a few occasions that she caned my youngest sister till she lied on floor with cane marks all over her body and threatened to cane her to death. She wantonly 8 yrs old back then. I was scared to death. I realised that my beloved mommy suffered from depression after that fateful assault. 365 days, 24/7, after she was discharged from the hospital, we became the objects for her to vent her anger and sadness throughout our entire childhood and even adult life. I was deprived of sleep and would cry myself to sleep every night as I heard her screaming into the night.vWhen I was 10 yrs old, and one day, while I was alone in the house taking a bath, my father came back for lunch and he tried to force open the bathroom door and I used all my body strength against the door, to prevent him from entering to molest me. Thank God that he failed and left for work. I was scared to death. I tried to commit suicide when I was 11 years because I couldn’t bear all these nonsense anymore. I was planning to jump down a building. But then, at that moment I felt a comforting small still voice telling me that He loves me and everything is going to be alright. I aborted the plan and continue to live on. I came to know and accept Jesus Christ when I was 13 yrs old. He worked miracles in this life of mine since then and now. I am 42, having a family of my own, and my mom passed away 2 yrs ago, knowing that Jesus loves her. Praise God! I had a boyfriend of almost 7 years. I got pregnant and on the 6th month of my pregnancy, I found out that he’s married 5 years ago. I am so devastated, crushed, torn (words can’t describe the feelings I had) and I felt like my life and my dream of a happy family was shattered. My dignity, self-esteem and image was all ripped off from me. This coming December 18, 2015 will mark my 1st year enlightenment anniversary (the day i found out that he’s already married because he insisted he’s not) and thank God I am coping. Although there are days that I lived in resentment and regret, I still managed to bring my life back. It’s very hard and it drains me all the time but when i came and read your posts, it moved me to tears realizing that I still have a life and I’m missing the beauty of it. Realization came pouring into me that I am blessed and there are more tragic situations that happened and is happening to other people which when I think of is beyond my capacity to bear. I thank God for your lives. Just as this moment that I realized that I am truly blessed of having a 5 month old daughter who brings joy to my life and knits my broken pieces. I really love her so much that I can’t trade anything for her. Through your site, I had seen my situation in a different perspective. Again, thank you so much. In this.. I recieved three phone calls for Job interviews, recieved a hug from someone I only knew in passing because of my contagious smile and laugh, and just in all feel happier. I feel that I can conquer the world and do what I want to do in it.. I feel that I can manage these curve balls again and the new ones that will be thrown later on. We don’t know what we have, love, or want until everything in life is taken from you. Dec 2014, My bestfriend was diagnosed with a DEADLY INFECTION in his right leg, the infection put him in septic shock(as it was in his veins and spreading like a wild fire – so the dr described it as) where he remained in the hospital for 14 days on life support. He was pronounced the sickest man in the hospital. Along side another family who had been given great news and reassured that their beloved one was on the way to recovery (she passed away a couple days late- May god be with her family.) While on the other hand our family was devastated and relying on nothing but PRAYER AND OUR FAITH in GOD. We prayed EVERY DAY, ALL DAY IN THE POWER OF GROUP PRAER for a full recovery, we prayed to keep one of God’s angels here on earth where he belonged. We prayed WE would not lose a FATHER, HUSBAND, BROTHER, FRIEND, A LOVER OF CHRIST, & A GOOD HEARTED MAN WITH NOTHING BUT HAPPINESS IN HIS HEART. WE prayed and we prayed and after the dr told us he had a 3% chance of life and that we would not see him tomorrow morning and to prepare for the heart break and new changes that were going to happen…. He is here a year and a half later healthy and recovering with his new prosthetic leg. Everyday my depression kicks in horribly where I don’t want to live here anymore and just be with GOD but the strength of my Dad who fought for his life keeps me going and makes me realize I am truly blessed to be here and to be a mother to a beautiful 2 year old girl who looks at me like I am a goddess. Keep going it’ll get better and if u lose hope remember you are HERE FOR A PURPOSE NO MATTER WHAT LIFE THROWS AT YOU!